GRAFENWOEHR, Germany — German households and businesses, including DoD families and Soldiers living off-post at USAG Bavaria, will soon be required to separate biodegradable waste from non-recyclable refuse, according to a new regulation. The DoD Environmental Final Governing Standards for Germany, a document that establishes compliance with German federal regulations, notified waste management teams at military installations last month. Counties across Germany will begin implementing procedures, if they have not done so yet, said Helmut Bueller, Waste Management Officer for Tower Barracks. Depending on the counties’ individual waste management statutes, communities will either create a designated drop-off zone for bio waste or provide routine pickup services, Bueller said. The definition of biodegradable waste — also called “bio waste” — may change from county to county. In general, bio waste consists of compostable kitchen and yard waste. It includes items such as leftover bread, fruit peels, coffee grains, egg shells, vegetables, grass clippings, dead flowers and pieces of wood. Bio waste does not include meat or dairy products. For a detailed description of bio waste for cities in Tirschenreuth, see the city’s updated trash separation chart here. Tirschenreuth County, which has jurisdiction over the towns of Erbendorf, Kastl, Kemnath, Kulmain and Thumsenreuth, will be next in Bavaria to enforce the new regulation. According to Bueller, other counties will soon follow suit. Beginning April 1, cities in Tirschenreuth will offer bi-weekly pickup of biodegradable recyclables. Tirschenreuth waste management teams will also equip each leased, and private, rental housing unit with a 120-liter “biotonne” container, Bueller said. The biotonne bin is black with a brown lid and has instructional stickers adhered to the surface. Soldiers and DOD family members living in leased, or private, rental housing in Tirschenreuth communities must begin sorting biodegradable materials from their refuse bin, Bueller said. The new biodegradable bins will also have house numbers and address details affixed to the lid to uphold accountability and ensure compliance. In September, Neustadt County, where Eschenbach and Netzaberg are located, is expected to implement a routine pick-up system. According to Bueller, the USAG Bavaria waste management team will inform the public as soon as details on the future changes solidify. At present, only Soldiers and families living in off-post counties will be affected. 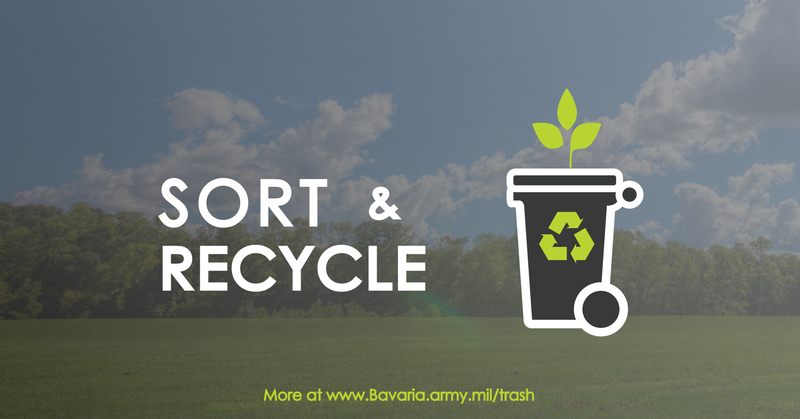 www.Bavaria.Army.mil/Trash — Find the updated waste pickup calendars and trash separation tables at the garrison’s recycling page. Beginner’s guide to trash and recycling at USAG Bavaria — New to the area? Get started on recycling with this guide. Self-Help — Pick up a hardcopy of the pickup calendar and separation table at your local Self-Help store. Still have questions? Call the Separation or Recycle Trash, or SORT, Coordinator.